Back in 1998 when I started rehearsing with Racetrack Babies I did not really know how to play the guitar. I had started learning it on an acustic guitar in my apartment in Stockholm where i wrote my first song, Cushion. 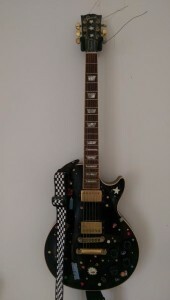 At that time Jacob had a cheap extra guitar which he had in the rehearsal room which I got to borrow sometimes. That made me interested in learning how to play the guitar. It ended out with me playing more and more guitar at our gigs and when we jammed. In the end i had to purchase my own guitar. At that time my sister lived in N.Y. and when I went to visit her I also wanted to purchase a guitar. I went down to Sam Ash and immidiately fell for my black Gibson Les Paul with gold pickups. I returned to the shop several times to make sure it was the right decission, but as in many other aspects in life sometimes you just know what is right at first sight. I was not a very good guitar player at the time, so sometimes it was a bit embarrasing hanging out in the guitar shop just trying out a guitar. I only knew a few chords and I think I invented the riff in the shop, for the song which ended up as beeing “Unprepared” later on the Racetrack Babies Album “The End.”. While I played that riff a dude came in from the streets with a Rastafari hat and banged his head and said: “thats a great riff mann”.. And i bought the guitar on the spot. Sometimes I wonder if the Rastafari dude was hired by the shop to help them close the deal faster. The Gibson guitar has a solid sustain and gave me more than what i put into it, and I guess that is what defines a good tool. When I play noisy parts and chords the noise gets full of melodic overtones and i love that. Thats why i chose that guitar. I remember the first time i had to play an intro on that guitar at a GIG and I had rehearsed for weeks to get it right. That was the intro to God Bye which ended up on the Racetrack Babies album “Love Sick”. Many mistake that song for having a spelling error in the title, but it does not. I wrote that song and intro in New York on the 33’rd floor, in an apartment overlooking Manhatten. The Guitar store had kindly lent me an amplifier. Did you know that there is a building in New York with the number 666 on top of it? Well there is and can you guess the reason for title now?